This is an extended discussion of the question that appeared in the Viewpoints department of the May/June 2015 issue of Dimensions magazine. The process of 3D printing alone has all kinds of inherent teaching opportunities, and in most cases the best part is the student can take what they create home! We have five 3D printers, with one on display in our gallery. It is a fantastic science, technology, engineering, art, and math (STEAM) conversation starter and an enticement to explore this 21st-century tool further by attending one of our programs. We are partnering with local schools to 3D-print mechanical hands for local recipients who are missing one or both of their hands. Students use what they learn in class to solve a real-world problem. In another project, children ages 8 to 10 will use Minecraft to build a Mars habitat. We will 3D-print their habitats and display them on our Mars rover exhibit for two weeks. Then they can take them home. We are planning programs that involve a local needs assessment; we will then fulfill that need through 3D printing. We also use our 3D printer for exhibit design and signage. 3D printing empowers people to think creatively by giving them the ability to create physical objects that can change people’s lives, fulfill a need, or improve upon existing objects. There are currently three main uses of 3D printing by museums: (1) educational exhibits about 3D Printing (including Maker Faires and Fab Labs), (2) scanning and replication of original pieces for hands-on studies and educational purposes so that the original piece doesn’t have to be handled, and (3) restoration of damaged artifacts and exhibits. Educational exhibits about 3D printing have been installed in museums in order to informally educate the public about the “next industrial revolution.” Maker Faires are now held every year in three U.S. cities (San Mateo, California; Dearborn, Michigan; and New York City) with smaller events (Mini Maker Faires) all over the world. As of 2013, there are over 125 Fab Labs in 34 countries. It can be expected that within a few years, all natural history museums will have a dedicated scanning and modeling department. We can reliably expect that the wholesale scanning of their collections will be achieved within the next few years, creating an alternative way of both viewing and experiencing their collections first hand. For the preservation of large cultural relics that are subject to weathering and decay by environmental factors such as extreme temperature changes and humidity, 3D scanning may be used in an attempt to preserve their original state, and as a marker to assess degradation. Scanning also helps with restoration efforts as it provides valuable baseline reference material. As a collection-based institution, we hold many artifacts in our physical building. As an educator, I envision a future where our collections could be shared in a digital format—not just in photos, but also as 3D scans set to print. Do you want to teach about herbivores, omnivores, and carnivores? Here, print these deer, bear, and wolf skulls. Curious about classic pottery? Here are files from Greek, Mesopotamian, Hopi, and Chinese cultures. Imagine using an MRI of an Egyptian mummy to print his skull, or even take it further by having a forensic artist reconstruct it. I am currently working with Makers Empire, which I have found to be the best software package to get students designing and working on projects, but print time is still the biggest issue. It can easily take three hours for a single project to print. If I had a camp of 12 kids who each designed a project, that would be three days of solid printing. Until 3D printing gets faster, I pre-print multiple objects, like my rocket nose cones, before programs. During the rocket program, I print one new one to show visitors how it works. The printers in my maker space are used more to show the technology than as actual tools for public use. 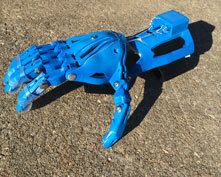 As a museum, though, we can offer opportunities like working with the e-NABLE community, where our printers could be used locally to help print 3D prosthetic hands or support other similar projects. We currently have, and use almost daily with visitors and students, several 3D printers in the Wanger Family Fab Lab. We are already seeing powerful changes in the youth who learn about and use 3D printers in our lab in short-duration and multisession experiences. Other museums and science centers are having similar experiences as we continue to lower or eliminate the barriers to accessing this technology and the design and engineering processes involved in digital making. I envision 3D printing having a more prominent place in exhibit design, development, and maintenance in the future. In the professional manufacturing world, 3D printing is used to rapid prototype ideas. I think over the next few years, we will see more 3D-printed early exhibit models and, at some point, 3D-printed, full-scale working exhibits. As low-cost 3D printers become more capable in speed and variety of printable materials, size, and detail of what can be printed, I think we will see more programs where visitors design and print out their items. We see 3D printing as an increasingly important part of our science center and our community. We are opening a Maker Garage in April, a work room space on our main gallery floor with four new 3D Systems (3DS) Cube 3D printers we were recently awarded, as well as a MakerBot printer donated by a board member who runs a video game company. We are also now part of the MakerLab Club community, an initiative of 3D Systems, the American Library Association/Young Adult Library Services Association (YALSA), and ASTC. We see the personalization of additive manufacturing through 3D printing more and more. We have used our MakerBot 3D printer during the Science Festival of the Capital Region, to print busts of Thomas Edison for General Electric, and as part of a project in cooperation with the State University of New York at Albany that printed a prosthetic human hand. We are excited to expand our 3D printing programming with the new Maker Garage, where we are offering half-day workshops during April school break and weeklong classes during the summer. We envision that 3D printers will take their place alongside scissors, tape, traditional printers, and hot glue guns as a way to support learning. They will expand the world of what’s possible in science center educational programs. Applied thoughtfully, 3D printing opens new possibilities to improve learning where physical limitations previously existed. Creating cases for small computers (Raspberry Pi), a robot chassis, or custom enclosures for small electronics projects in a computer science class. Modeling and visualization of science concepts and supporting invention and engineering education are areas where we apply 3D printing and envision its use for the future. We are leveraging 3D digital models and prints of selected collections objects for K–12 learning. With generous private foundation support, we aim to advance critical thinking through interactive, collaborative, student-driven investigations. We tested a program prototype in 2014 with 10 Title I sixth-grade classrooms in Utah, some urban and some rural. (Title I schools have large concentrations of students from low-income backgrounds.) Students used museum-provided 3D objects and materials to tackle authentic research questions relevant to the provided objects. Additionally, we are conducting learning research to assess the critical thinking taking place with this program prototype.